Do you hate the guys trying to optimize every single part of a process? I'm one of those. Believe me, it's even harder for me. When I sit next to someone watching him writing something, taking the hand off the keyboard to mark a portion of text with the mouse, make a right-click just to copy&paste... I could explode. Although, I'm quite fast with our SE editor, there are some things which could be further optimized. One big first step was the Image Uploader. But there is another thing I always liked to have. A fast way to insert links to the online documentation of Wolfram. If you look at the URL style of e.g. you see, that Plot can be exchanged with most other Mathematica functions and it works, because most of them have a reference page. Now wouldn't it be awesome if we had an additional button on the editor toolbar which when clicked transforms the marked text PlotStyle into PlotStyle? This won't work for all functions but I'm sure, it helps quite a lot. Another thing is, I'm the theta kind of guy. While I can at least live with the θ guys, I absolutely hate the \[Theta] ones. I think everyone agrees that the last option is the least readable. If there would be another editor button which just replaces the FullForm greek characters of a marked text, I'm sure this would be used very much and would help the readability of the code on our site. Question: Is there a way to extend the editor on our main site? Chrome or Vivaldi – Install from the Chrome Web Store. 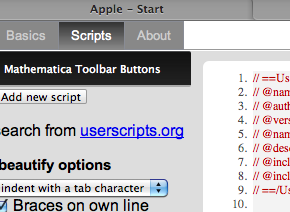 Safari – Install NinjaKit, reload the page, then click here: m_toolbar.user.js. Extra instructions for MacOS 10.14 below. Detailed instructions for any browser are below. I hereby proudly present a browser user-script (userscript) which adds the required functionality to the editor of mathematica.stackexchange.com. This script is the slightly changed version of the Ask Ubuntu Toolbar Buttons which only exists due to the incredible work of Nathan Osman. Additionally, I added a button which is maybe rarely used, but when it is used, it saves a lot of tedious html-tag typing. With it you can insert shortcuts easily. Just click the button and insert the short-keys separated by space. Therefore, when you type Ctrl C in the dialog you get Ctrl+C. Chrome users can download this extension directly in the Google Chrome Webstore. and install it into your browser. I have tested the script in Linux and Mac OSX. In Chrome you install it by storing the file m_toolbar.user.js locally onto your hard-drive. Then you go in Chrome to Menu->Tools->Extensions and drag&drop the file there. After a reload of the SE page, the buttons should appear. In Safari (I tried OSX 10.6 and 10.8) one easy way is to use NinjaKit, which is an extension that lets you install user scripts. where you can manage your user scripts. MacOS 10.14: Extensions such as NinjaKit are depreciated as of MacOS 10.14. Use the workaround detailed here to get around this problem. You may need to re-enable NinjaKit every time you restart Safari using the Safari menu Develop > Show Extension Builder. Download m_toolbar.user.js](https://github.com/halirutan/SE-Editor-Buttons/raw/master/src/m_toolbar.user.js) as a text file. Click the NinjaKit button then NinjaKit's "Add new script" button. Copy the downloaded m_toolbar.user.jsand paste it into the "Add new script" window, overwriting the skeleton script that's already there. For other browsers please read the existing article on stackapps about how to install user scripts. Updated tool-tips for a better English. Thanks to m_goldberg for the help. Introduced another button for the stripping of In:= and Out= marks. For this you have to select the complete codeblock where the I of In is the first letter in the selection. Pressing the button removes the marks and comments out the output. Buttons-style is now more consistent with the webpage. ssch was so nice to extend the list of unicode characters by all characters of the Listing of Named Characters which have a unicode representation. I moved the code into an official repository which is linked under the section Installation above. A recent update to Chrome on Windows disables extensions which do not come from the Chrome Web Store, with no simple way to re-enable them. There are various workarounds here. I have used the "import the unpacked user-script in developer mode" solution, which is working fine though you do have to cancel a "disable developer scripts" dialog every time Chrome starts. Create a new folder and move the m_toolbar.user.js file into it. Open the extensions page in Chrome (menu-tools-extensions or navigate to chrome://extensions/). Check the "Developer mode" option at the top right. Click the "Load unpacked extension..." button and select the folder you created. 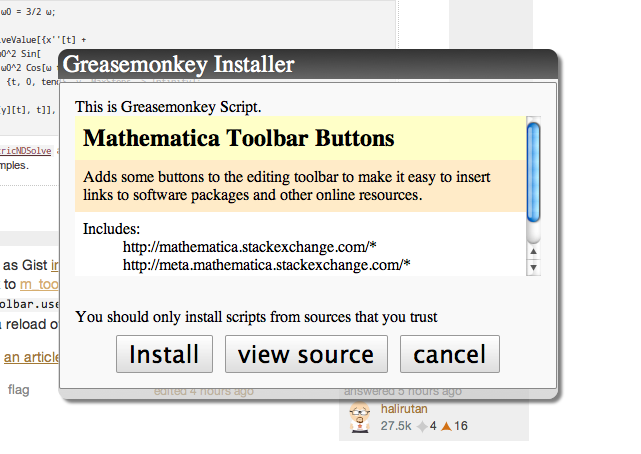 That should be it, after reloading mathematica.stackexchange the buttons will be back. Update extension from the author. Not the answer you're looking for? Browse other questions tagged discussion site-tools . Is there a way to facilitate the copy&paste process for code samples? Are requests for book reviews on topic?